Sausage and Cream Cheese Quiche - so quick and easy. Everyone LOVED this recipe!! Can make ahead and freeze for later. Pie crust, sausage, cream cheese, cheddar cheese, heavy cream, eggs, sour cream and pepper. Ready to eat in an hour. Great for breakfast, lunch or dinner. THE BEST! Quiche is one of our favorite meals. We usually eat it for lunch or dinner. I'm always thinking of new flavor combinations to try out. 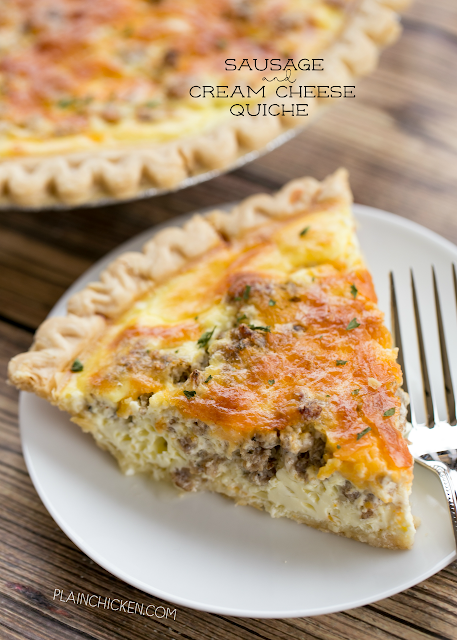 I decided to try a quiche with our favorite combination of sausage and cream cheese. WOW!! SO good!! We ate this for lunch and dinner the same night. 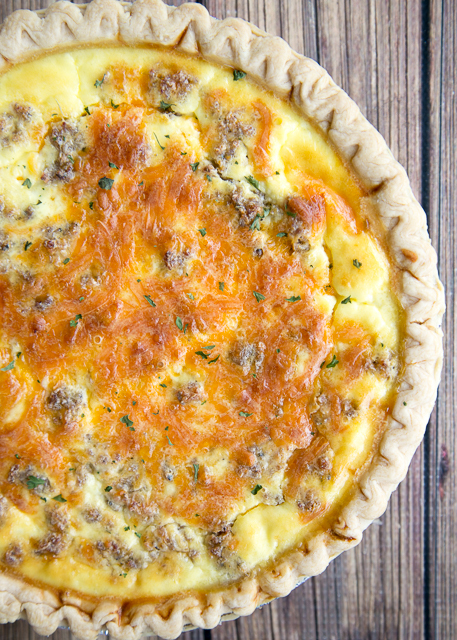 This Sausage and Cream Cheese Quiche can be made ahead of time and frozen unbaked. I actually like to double the recipe and freeze one for later. We both really, really enjoyed this quiche. It tastes great and was super easy to make. We loved it so much that I am actually making it again this weekend. Add this to your menu! It would be great for Easter brunch next month or Mother's Day. This recipe has definitely gone into our dinner rotation. Enjoy! In a skillet, cook sausage until no longer pink. Drain fat. Combine cooked sausage and cream cheese. Drop crumbles of sausage mixture in bottom of pie crust. Top with shredded cheddar cheese. Whisk together eggs, pepper, sour cream, pepper and cream. Pour egg mixture over sausage and cheese mixture in pie crust. And how do you cook the frozen unbaked quiche? (I need specifics.) Thaw it first? Bake the frozen quiche? Thaw it first and then bake. Thanks for another great idea Steph! Sausage and cream cheese together is one of my all-time favorite combinations too!!! I live in Canada and we do not have Jimmy Deans or Tennessee Pride any suggestions on what other kind of sausage I could use would any kind of breakfast sausage work. Any breakfast sausage will work fine. Enjoy! You add the cream cheese to the warm skillet and melt it into the sausage ? I just stirred together the cooked sausage and softened cream cheese. I didn't put the cream cheese in the skillet. Does the pie crust need to be thawed? No, it doesn't need to be thawed. Great recipe..so light and fluffy. We love quiche, I made this the other night for dinner with a few additions; a few sliced fresh mushrooms, 1/4 of green pepper finely chopped and one small onion finely chopped. I browned the sausage, scooped it out of the pan with a slotted spoon, added the veggies to pan to sauté for a few minutes then added the sausage back in along with the cream cheese till it melted and coated everything. I served the quiche with a tossed salad and a delicious dinner was served. My husband loved it, he didn't want to stop eating. Definitely a keeper! Can you use a refrigerated pie crust instead of frozen? Can you use a refrigerated pie crust? How do you think this would fair if I went crustless to make it low carb? I think it would be fine. I’ve been testing some low-carb recipes similar to this and they turned out great. Could I prepare this the night before and leave in the fridge and then cook the next evening? How many calories would you guess were in it if you did without pie shell & made muffins instead? This was 100% perfect. Saved this recipe to use again and again. If I used refrigerated pie crust, would I need to bake the crust first? I don’t think so. The frozen crust isn’t baked. So I wouldn’t think a refrigerated crust should be baked. As always, please use your best judgment regarding substitutions and modifications. You might like this variation. I use 50/50 sausage and ground beef. while the meat is cooking I add 1/2 tsp ginger, 1/2 tsp cinnamon, a sprinkle of nutmeg and a tiny sprinkle (1/8 tsp? I don't measure) of clove. Once the pie is assembled I add a bit of parsley on top before baking. It sounds unusual but tastes amazing. This is a big hit with my family.